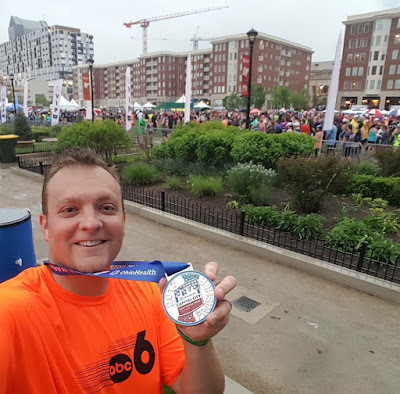 I did more of a recap yesterday with photos, but I am writing this to clear my head (and the air) and look back at the situation from Saturday with the Cap City Half Marathon. I have talked with other runners the past couple of days and everyone seems a tad unsettled... just like Saturday's weather. Please hear me out... and read to the end... hopefully it will bring peace to some of your hearts, minds, and sore muscles, for those who ran. So here is the radar from 8AM, which was the start time. 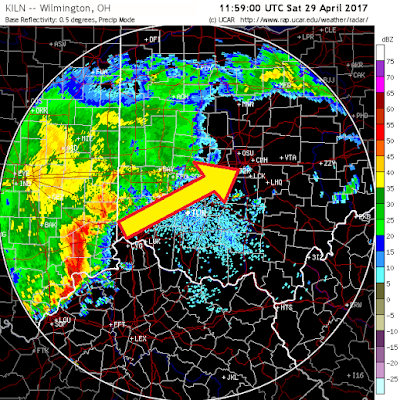 Columbus was dry with just a few sprinkles. GREAT running weather, but I am sure that big red blob is grabbing your attention. So much so, that I mentioned it while being interviewed on Good Day Columbus just before the race. (Video above will play in desktop browsers) It was coming and I knew it. So I ran fast... I shaved off more than a minute off my mile time splits. 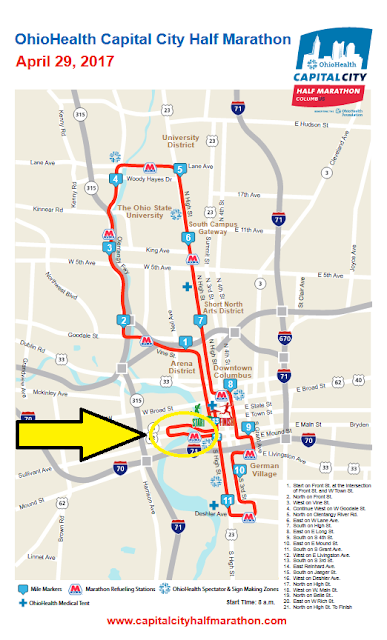 Eventually the race was called because of the storm and I was not able to finish the final loop over the Scioto River and that means I only ran 12.4 miles out of the 13.1 mile race. I was devastated at first because I was on pace to have a HUGE improvement in my Half Marathon time, but none of it counts because I didn't reach that distance. And the crowd was HUGE at the finish line with thousands of runners, so I couldn't even run a little more to get to the 13.1. The race was cancelled and runners were re-directed to cut the course short everywhere and get to the finish. So everyone spread out on the course all collided back at the finish. We were handed medals, but it looks like only about 20% of the runners actually ran the full 13.1 miles because I was RIGHT at the cut-off for running the shorter distance. 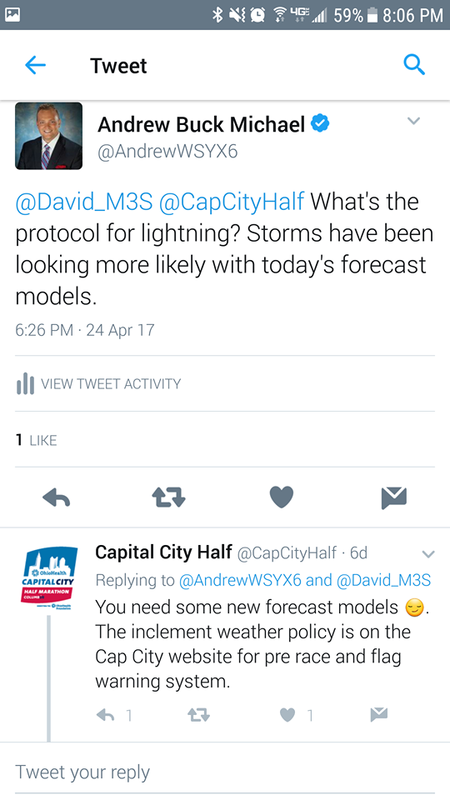 And we knew storms were likely... as a matter of fact, this is the tweet I sent to the race account and the race director on Monday! The chance of rain didn't change through the week because there was a big low pressure system that was expected to bring lots of rain and storms. -Could the race have been moved up earlier? Not really... it would be next to impossible to let all 14,500 runners know and get them there in time because some were driving in from out of town. Plus this means shutting down roads earlier and less spectators because they may not know of the time change. -Could the race have been delayed? No, in fact this is less plausible. You still have to let everyone know the race is delayed. PLUS, if the decision was made right before the race start then you need to find a spot for all these people to find shelter from the storm. This also means WAY more OT for police stopping traffic and roads being shut down for even a longer period of time. -Could the race have changed dates... to Sunday? Possible, but a lot of hurdles. Getting the word out would be an issue. Plus course volunteers and police might not be able to work the following day to help secure the course. Same for hydration station volunteers. Then what about people who were flying or driving out of town later Saturday after the race? Then the issue of shutting down the roads on a Sunday morning and making sure the police have the day off to help. There is no way the race organizers could have let the race continue any later than they did. Shortly after I got to shelter the skies opened up and there was a LOT of lightning. They needed to take action to get people to safety and they made the right call with calling the race. The bad part is that some runners were stranded on the route and not able to make it back before the worst of the storm. If someone was struck by lightning and the race was allowed to continue then it would have been a HUGE problem. We all are safe and can run another race. This doesn't change my feelings toward the medal. It's a beautiful medal, but I don't feel like I earned it. I didn't run the distance I signed up for. I paid for the race, I crossed the starting line, and I crossed the finish line, but I feel cheated... almost because I CHEATED by cutting the course short. So it is almost like I am letting myself down. It would be awesome if there was a "rain check" or a discount for returning runners for next year. I know I am not alone in the feeling of lack of closure. There are two minor things that could have been different before the race was cancelled. First... I think alerting the runners through the race, for the storm, would have been a good idea. There are flags up around the course. Above is the image from the Cap City website for their flag/inclement weather protocol. The ONLY flag I saw was the green flag and I tried keeping an eye on them. Secondly... Maybe alerting runners before the start of the race. There was the stage and PA system. Letting runners know of the storm coming would have been a good call. Or telling them that the course may get closed if the storm stays on track. Or even a heads up the night before or the morning of on social media so people would plan accordingly. So does this bring closure? Maybe mentally. Could things have been changed... not really. Runners needed to get to safety. The organizers made the right call to get people off the course. Now there is the bag check issue with gear taken 20 miles away for pick-up because of the rain... but I didn't have to deal with that, so I don't want to chime in on that. Either way... a decision had to be made with the race and storm coming... And in the end... we all get to race another day. Mother's Day, 20 mile run, and HEAT returning!